Beautiful, spacious and freshly renovated old stone town house close to the Calvari Steps. Private swimming pool and terrace with views of the mountains and town. Situated in one of the best and most tranquil streets in the heart of Pollensa just a 3 - 5 minute walk to the magnificent Church Square, fabulous pavement cafes and traditional Spanish restaurants and shops. Offering 1 double bedroom with en suite and two twin rooms, 2 further bathrooms, fully equipped modern kitchen with dishwasher, microwave and washing machine, large lounge/diner overlooking the mountains. WiFi/TV/DVD and HiFi. The property also benefits from central heating. The house has three bathrooms consisting of one en suite, one full bathroom with separate shower and one shower room with toilet. 1 high chair and travel cot available, extra cots/high chairs etc., can be arranged for a small fee. Fantastic house with lovely pool in a perfect spot in Pollenca. We had a wonderful week in Pollenca staying at this perfect house. Our family had a warm welcome from Ron who guided us to the house. It has a lovely pool which is not done justice by the photos. The facillities are great and the property is only a short walk from the beautiful centre of Pollenca town. Beautiful house feat views exellent! As soon as we arrived with great help from Colin I knew i handpicked a superb spot! I was so pleased with the high quality of the interior and added bonus of our own pool to dip in! Being in town ment easy access to great restaurants and being in festa season lovely sights to see in the square and surrounding streets! Not too far to explore fab beaches. Overall a really relaxing chilled holiday and we will definitely return to beautiful Mallorca! Had a great week, Ron was very welcoming, the Townhouse is ideally located with morning coffee and pastries and evening drinks and dinner all within an easy stroll. Beatiful property, in a wonderful location. Pollenca is a lovely and interesting town with many great places to eat and much to see. This property is located with wonderful views over the town and the surrounding hills. The swimming pool is bigger than we expected and perfect for cooling off on a hot day. All the necessary facilities were available in the house, which was tastefully and comfortable furnished. Access to UK TV via satellite was a bonus. Beautiful townhouse. Very spacious and the pool is a great bonus. The house is gorgeous and has everything you need for a great stay. In a great location quite near the square. Location not recommended for someone with mobility problems. Beautiful town house with stunning views of Pollenca! 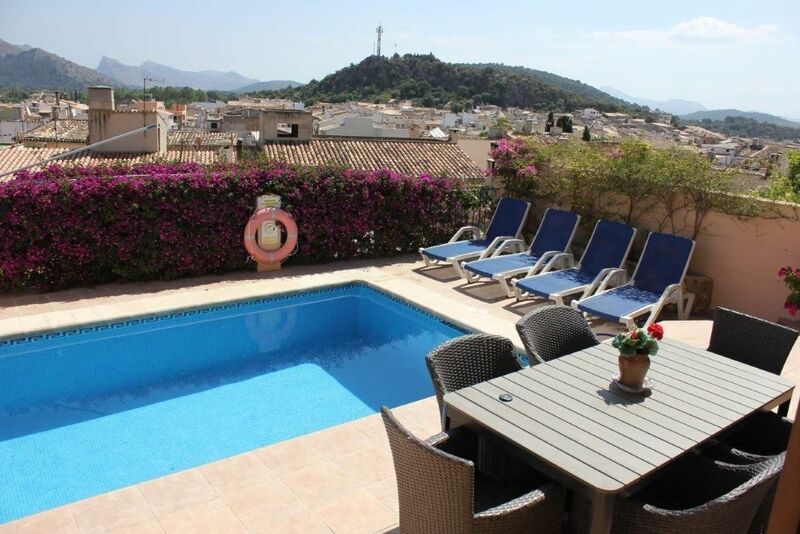 This town house has outstanding views of Pollenca! There are three large bedrooms, one is by far the best with en suite bathroom and an amazing balcony view. It is typically Spanish in decoration, and plenty of space to relax. Our grown up children enjoyed spending time in the living room with Sky Tv, a selection of books to read in a large bookcase, and the kitchen is very well equipped. The pool is a good size, be careful if you have young children as its all deep and no shallow end. Also, we normally enjoy the pool and sunshine until late in the afternoon and were a bit disappointed when the pool and terrace was completely in the shade at 4.30 pm and we don't normally come in until much later. Beware there is no air con in the bedrooms. It may be an investment to provide this in future, getting ready to go out at night was challenging in the heat. You will have a fantastic holiday at this accommodation, and it's very safe and quiet. originally a fishing village, the enchanting resort of Puerto Pollensa has everything, wonderful scenery, beautiful sandy beaches, fantastic cuisine and a laid-back friendly atmosphere. The sheltered horseshoe shaped bay is set against the stunning backdrop of the Tramuntana mountain range. The resort of Puerto Pollensa is arguably Mallorcas finest. Despite its success, Puerto Pollensa has managed to retain its charm and a somewhat understated character as well as its rather exclusive feel. If you or any kids or adults in your group wish to be active, there are numerous activities available to you around this area including Trekking/Hiking, Climbing, Rock Scrambling, Swimming, Scuba diving, Snorkelling, Abseiling, Paragliding, Helicopter Tours, Mountain Biking, Kayaking/Canoeing, Caving and Horse Riding. These are all possible in the north of Mallorca, in or around the areas of Alcudia, Pollensa and Cala San Vicente. The North of Mallorca is spoilt for choice when it comes to golfing, the two places are the Pollensa and Alcanada Golf Courses. Golf Pollensa is a nine hole course that is perfectly integrated into the beautiful local environment. The course offers panoramic views over the Tramuntana mountains, olive groves, the bays of Pollensa and Alcudia and s’Albufereta reserve. Golf Alcanada is the only 18 hole course that is right by the sea. It has 58 well placed green side fairway bunkers, challenging greens with hidden breaks and difficult but fair tee shots, making this golf course a must for all experienced golfers travelling to Mallorca. Steeped in history, the charming old town of Pollenca, approx. 3 miles inland from the coast, is arguably the most attractive town on the island. The regions cuisine is also regarded as one of the finest in Mallorca. Pollenca boasts an excellent array of superb restaurants, cafe`s, bars and shops, which can be found in and around the main square, The Placa Major, a truly magnificent place to sit and watch the world go by. The market in Pollenca, which takes place every Sunday, dominates the main square, spilling out in to all the side street`s is an absolute must. Long weekend breaks and short weeks are available out of high season. Please call to check prices. In high season we request a Saturday to Saturday booking but in other seasons this is negotiable.